If you’re missing all of your teeth on one or both jaws, you need a solution to tooth loss that fits your needs, comfort level, and lifestyle. Now, advancements in dentistry provide multiple options to treat tooth loss using prosthetic teeth. Among the most common options are removable dentures and implant retained dentures. While both are effective for resolving tooth loss, there are clear advantages and disadvantages to each. As a dentist in Annapolis for dentures and implants, we have everything you need to know about replacing your teeth with these options. New technological advancements now make dentures a preferred option for convenient and affordable tooth prosthetics. Dentures essentially lay over the gum to provide prosthetic teeth for eating, speaking, and to support facial structures. New advancements allow dentures to look more natural, while offering a more secure fit for less discomfort and slipping. You’re able to eat and speak just as you would your natural teeth, then you take the dentures out for easy cleaning using specific denture products. However, while dentures are affordable and convenient, they don’t stop bone loss. 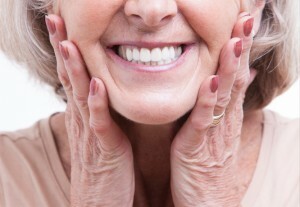 In some cases, the pressure of the dentures can actually accelerate bone loss. As a result, you’ll need adjustments and new dentures made periodically as your bone deteriorates. This is needed to ensure the dentures continue to fit and function well. Implant retained dentures are constructed similarly to removable dentures, with a pink gum line that supports the false teeth. However, they are held in place using 4 to 8 titanium posts that are implanted into the jawbone. While implants do cost more and will require surgery, they are the next best thing to your own natural teeth. Since the implants are held in place by posts, they aren’t removable so you simply care for them as you care for natural teeth. There is no slipping, discomfort, or food restrictions as they are secured to the jaw bone. You don’t need adhesives or adjustments made because they are made to last a lifetime as they stay in your mouth permanently. In addition, implants not only stop bone loss, but actually stimulate new bone growth. The titanium posts stimulate the bone and provide the support your jaw and facial structures need by restoring bone density. At Indianapolis Family Dentistry, we provide multiple options for treating tooth loss, including dentures and implant supported dentures. We understand that everyone has unique needs and preferences when it comes to replacing missing teeth, which is why we take the time to formulate a treatment plan that satisfies your needs and oral health. Dr. Farthing and Dr. Tepner will evaluate your oral health and individual needs to determine which is the right option for you. No matter your choice, we offer the latest advancements for implants and dentures as a family dentist in Annapolis. Let us help you regain your smile and quality of life with dental prosthetics. Call our office today at (317) 434-1642 to schedule a consultation.